By Laura Finnegan – originally published here. I’m from Louth, with a passion for sport. Despite (or because of!) this I had never seen a game of hurling until I was a wide-eyed 17 year old leaving home for college in Waterford, on a bus passing through Kilkenny. This might sound surreal to some, but despite there being hurling teams in Louth it just isn’t part of the culture and identity of the county as much as it is in other counties. What influences what we play? Lots of sociological and environmental factors influence what and how we play, all worthy of a blog in themselves (e.g. culture, environmental issues, what your parents/family played, socioeconomic factors, peer influence, gender, ethnicity, education)…all in good time. Place of birth is another factor that can influence not only what we play but how likely we are to succeed in that sport. As in the example above, where you are born can dictate what sport you’re likely to play (it will generally be the sport that’s valued in that setting, your school values it and wants to succeed in it so resources are found for it, clubs have a stronghold in the community, your parents/extended family/local role-models played it (often down to the specific position you want to play… I’m looking at you goal-keepers from Donegal!!) and can influence how successful you are (and organically drive these ‘hothouses’ of talent development, like the Skibereen rowers or NI golfers). Studies have looked at the birth place of professional athletes, analyzing athletes according to whether they were from large cities right down to those being from small rural areas. Those that were from small cities were most likely to make it into the professional game, but results depended on the context. There seems to be a sweet spot of the ideal size of a development area, where there are enough quality coaches, resources, teams, structures and opponents, balanced with being compact enough to develop relationships/socialise into particular sports, allow for informal play on streets/green areas, get enough game time and not be overlooked in favour of a larger cohort of earlier maturing players (see more about the Relative age Effect here https://talentdevelopmentinirishfootball.com/2017/06/27/relative-age-effect-in-irish-elite-youth-football/). What does this have to do with Irish football? For those not familiar with Irish football, the Emerging Talent Programme is the primary talent development mechanism run by the governing body for football in the Republic of Ireland, the FAI. It has undergone some restructuring lately but at the time of research it consisted of 12 centres countrywide, where the players identified as most talented in the surrounding 32 leagues combine for extra training. The location of these centres can be seen by the FAI badges plotted on the map, along with the population density of the country. I’ve looked at the county of birth for all of the ETP players over a 6 year period and analysed how likely you are to get onto the programme (compared to the relative populations). In the below map, the darker the county colour, the more likely a player is to make the ETP programme (ranging from A counties down to the more poorly represented E counties in white). Of the 10 most represented counties, 7 of those had an ETP centre in it. If there is an ETP centre in your county, you are 50% more likely to gain selection compared to a player without a centre in his county. 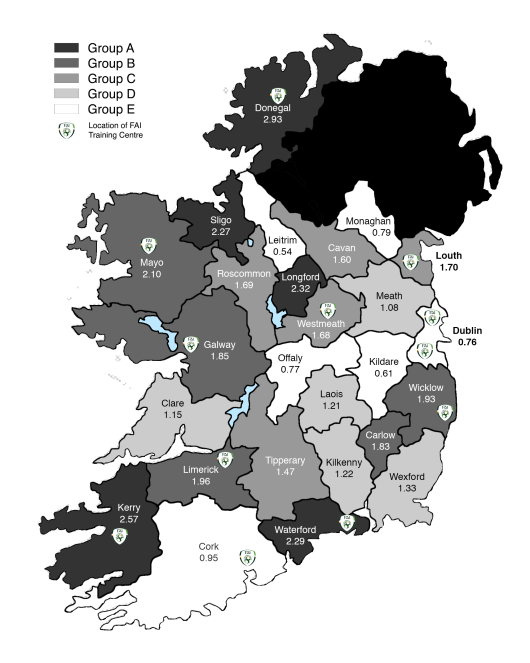 Donegal and Kerry had the highest amount of boys on the programme relative to its population, with Kildare, Dublin and Cork some of the lowest represented counties. Donegal only have 3.7% of the population yet account for 8.21% on the ETP. Put it this way, Dublin is the home of 26.4% of the boys this age… they feed into two centres, whereas 3.7% of the population live in Donegal …they feed into one centre. The graph below shows us the full range of representation, in a world of ideal structures, the percentage in ETP for each county would be similar to their CSO percentage (and they are in some cases), but some counties are underrepresented (i.e. Dublin, Kildare, Cork, Monaghan) with some being over-represented (i.e. Donegal, Kerry, Sligo, Waterford, Galway). Boys from Donegal are 5 times more likely to get a place compared to boys from Kildare. When we look broader than counties and assess the numbers by Province, inequities also exist. Leinster is underrepresented in the number of centres (15,462 boys feeding into each centre), with Connacht over-represented (8,715 boys feeding into each centre). The FAI’s purpose of spreading these centres around the country was to give everyone the ‘opportunity to train within their own geographical area’, setting a notional limit of 60 minutes’ drive to access one of these centres for everyone. That makes sense and is a positive thought process… but the hard facts here show us that we have to provide more opportunities for the higher density areas (e.g. Dublin, Cork, Kildare). Another centre is needed to allow equity of access for players in those areas. There are too many players feeding into specific centres (and minimal numbers in others). The FAI may have initially located the centres in traditionally strong footballing counties, but they should provide structures that are accessible to all who are talented enough to attend. The idea for the centres was that surrounding counties would filter into them. Anecdotally, it is usually coaches from within the county that run the ETP centre. One I visited recently has 5 coaches, 4 of them are from the county it’s based in, yet it draws from 5 different counties. Are coaches picking players that they are familiar with, rather than accepting players from the surrounding counties? A natural bias exists within us all (we often see an underage national coach picking large numbers of players from areas that he is familiar with, e.g. Dublin, Cork) is this impacting on a players chances of securing advanced training? The recent restructuring of the ETP has seen positive changes in terms of access to players and starting earlier than the u15 age-groups. The location and number of these centres remains largely the same. In terms of fully analyzing this picture it would be to compare the percentages with how many boys are actually playing the game in specific areas (rather than by overall percentages of boys) to identify variations across counties, but these stats aren’t collected by the FAI/SFAI. This would help us to say that it is influenced by the football culture in specific areas and it would help to identify the influence of other sports in certain areas. Overall, you’re 50% more likely to gain a place in the ETP if it’s in your county. Each ETP centre should have to include a coach from each of the surrounding/feeder counties to minimise bias. Football Associations must look at national playing population statistics when deciding on the location of their talent development centres to strive for equity of access for all players, regardless of where they might be born. In the main, players from Dublin are thought to have many advantages to players ‘down the country’ (and thus why players move to the capital), but it’s worth noting that players from large cities are often at a disadvantage due to less opportunities for informal play, and now it seems that they are less likely to receive another key aspect of development, formal, deliberate practice (due to increased competition for places on talent development programmes). Whilst FA development pathways aren’t essential for player development, they should be fair and equitable to all those talented enough. Otherwise funding for these programmes should be analysed and reassessed. Next #Sky25 – Sky Sports as a Disruptive Technology – And is Sky being disrupted?